Here's my 2006 Burgman 650 review to help anybody that thinks that they want to buy a 2006 Suzuki Burgman 650 scooter. In my experience the 650 is practical, stylish and unlike so many other motor scooters it has ample storage space which is very important to get the most out of owning a scooter. I know so many people who have resisted buying a used Suzuki scooter because they say that they have to haul so much stuff like books or groceries. Their reasoning is the benefits of good gas mileage would be consumed by having to own and maintain both a car and a motorycle.
. If you don't read any further, please note that this scooter has an absolutely cavernous underseat storage area capable of holding two full face motorcycle helmets. And in addition to that there are three front compartments with lids that will easily hold many smaller items. This scooter is not a sissy, it has surprisingly strong acceleration that will get you around town or handle the pressure from the big guys on the highway. It has instantaneous throttle response provided by the refined fuel injection system and a Controlled Continuously Variable Transmission (SECVT™) which shifts smoothly and efficiently. In closing, my 2006 Suzuki Burgman 650 is not only good looking but has provided unparalleled performance and has all but eliminated my need to own a car. If you have questions or comments regarding this consumer's 2006 Suzuki Burgman 650 Review you may leave your comments, questions and contact information in the space below provided by GoGoCycles Used Motorcycles For Sale . GoGoCycles would also encourage visitors here to write their own 2006 Burgman 650 Review to help potential buyers make informed decisions and to benefit the biker community as a whole. 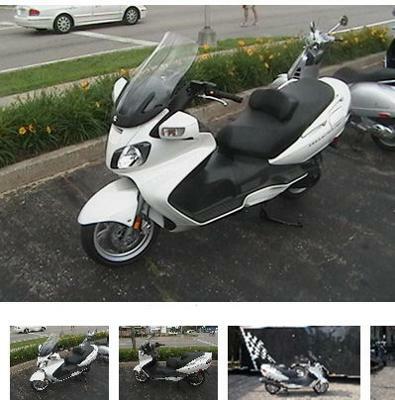 What is the stated motorcycle Blue Book value for the 06 Burgman right now? Ride a scooter all year round? Nope! I think it's humorous to see people sliding around on their scooters, put putting around in the snow or rain. Burgmans are great but you had better have a car to ride in as well.